Do you want to fix corrupted USB pen drive that have USbest ITE IT1171 Chip controller .Download ITE IT1171 DtMPTool and fix corrupted ITE IT1171 and UT1171 chip controller . Hello My Dear friends , Today we will explain how to repair a corrupted USB flash drive that have USbest chip controller .ITE IT1171 DtMPTool allows to format and update firmware for ITE IT1171 and UT1171 chip controller .ITE IT1171 DtMPTool V1.71D.0.97 can restore the original flash drive firmware like factory reset .If you have problems with USbest USB flash drives like "Formatting Problems , Write -protection problem,Insert disk problem and other flash drives problem ,So you can use ITE IT1171 DtMPTool to fix corrupted flash disk problems .Follow the next flash drive repair tips . You must be sure that your flash drive chip controller is USbest ITE with chip model IT1171 or UT1171 .You can use Chip Genius report software to detect your flash drive information . Download ITE IT1171 DtMPTool from the download links in the bottom of this article and extract the zipped folder . Connect your Corrupted USB flash disk to your Computer . 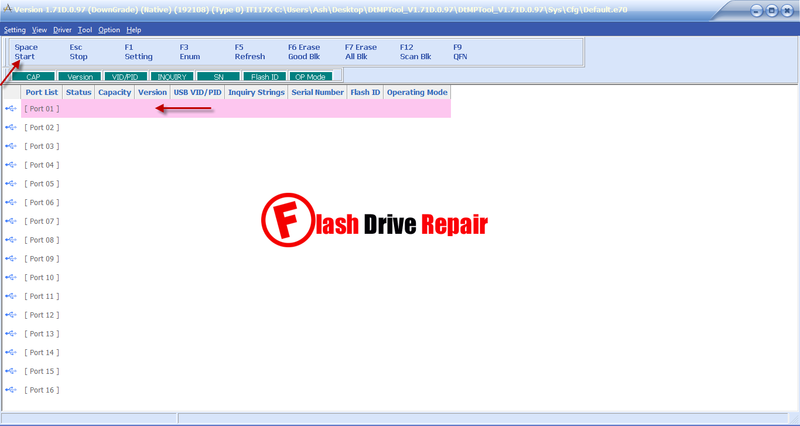 Open ITE IT1171 DtMPTool , If your Flash drive chip vendor is ITE IT1171 so you will see the flash drive information in the program interface .Click Start to begin flash drive repair process . Wait until finish updating your flash drive firmware and don't disconnect the flash drive while updating .